This war deck was issued to commemorate the signing of the Armistice. 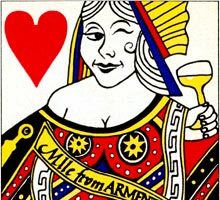 It is often known as “Mademoiselle from Armentiers” but the name is actually “26th Yankee Division Playing Cards”, to whom it was dedicated. The four Queens represent the four Mademoiselles made famous by the popular WW1 song “Parlez Vous” or “Mademoiselle from Gay Paree”. The Kings and Jacks are soldiers of various ranks. The deck was designed by Alban B. Butler Jr and printed by the Press of the Woolly Whale, New York, in 1933. The owner of this publishing house was Melbert B. Cary, who had belonged to 26th Yankee Division and whose collection of playing cards is now owned by Yale University. 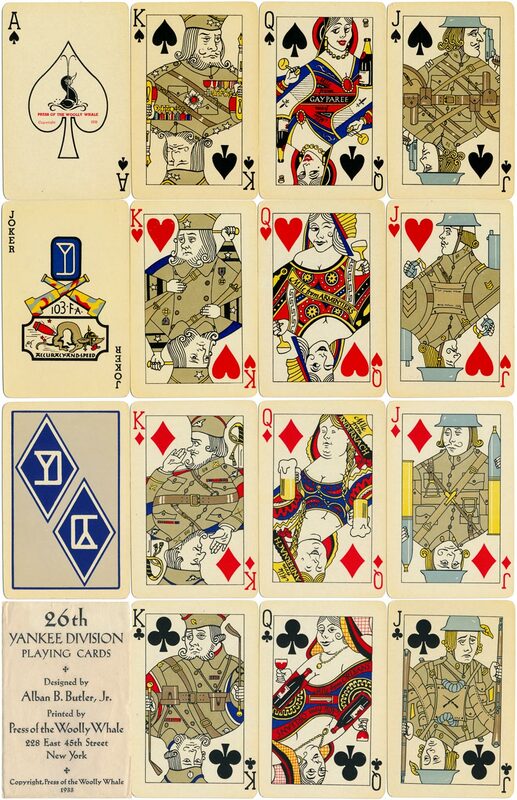 Above: “26th Yankee Division Playing Cards”, designed by Alban B. Butler, Jr and printed by the Press of the Woolly Whale, New York, 1933 in a limited edition. Images courtesy Barney Townshend. The Press of the Woolly Whale also published the book MLLE from ARMENTIERS shortly after the first World War, which tells of the history, origin and background of the song of the same name. The original song was expanded by WWI troops to many hundreds of verses. When first published it was a requirement to prove you were an American ex-serviceman to be able to buy it. • Press of the Woolly Whale Collections.